The Gossen Digisix is my replacement for my now completely dead vintage Gossen Luna Pro. It's small, lightweight (unlike the old GLP which was the size of Spock's old tri-corder from the TV series and was like a lead weight hanging around my neck). It's very accurate, and also measures contrast. For $169 it's the cheapest light meter you'll find out there, and works great for DSLR video work. Can't afford those awesome $800 Sekonics? Get one of these instead. Not half as interesting as analyzing the many line paths on your palm Shian, interesting life you've led according to my palm reading book. On a more serious note, any light meter tips specific to the GH2? I was surprised to find that by using the meter alone, and ignoring the EV meter in the camera I was able to get more accurate exposures, and great looking footage on my last GH2 shoot. From now on, I will listen to the meter and not the camera. It seems to have a better grasp of the situation than the camera. As odd as that sounds. What are you finding inaccurate with the GH2 metering suggestions, at set ISO's. And yes, I read both incident and reflective. Any reason not to prefer 308DC? It is not much more. My gaffer just bought one (the 308) to use as a beater on run and gun shoots, where a meter might get broken while crawling into tight spaces and such. He broke it out to use on our last gig, and we both hated it. After 3 hours, he ditched and was just borrowing mine for the next 3 days. He keeps joking that the digisix looks like a toy, but I remind him that we kinda thought that the first time we saw the GH2, and look how that turned out. @shian (or anyone else) This might sound like a silly noob question, but I assume one advantage of accurate metering is to make best use of the limited 8-bit video range available to the GH2? I haven't used a meter since I had my old manual Zenit B camera, about a million years ago, and to be honest have never thought about using one since, until I read this thread. Normally if I was in a tricky metering situation like (say) balancing lighting from several sources I'd adjust the lighting while checking it in a monitor and then once the lighting was balanced, tweak overall exposure afterwards. I'm guessing that's a bit of a cowboy approach though! I really like the L308DC. I always have it in my belt and it has been a very helpful tool. The day after I got it, I shot a short film where I had to do without a proper gaffer (which was ok, as the director does gigs as a gaffer or best boy), but then a meter really sped things up, as I didn't have to go back to the camera. On my last gig we had a shot that was very low key, with rather spotted overhead lighting and then having a meter to check ratios was invaluable. And for anybody who has it, the GH2 is actually a bit more sensitive than was it is usually 0, so I had to set the Exposure Value to -0.6. Good to know if anybody is planning on getting one. Again. This is just my preference. Not saying the digisix is better than the Sekonic. Just that I didn't like it, and neither did my gaffer. 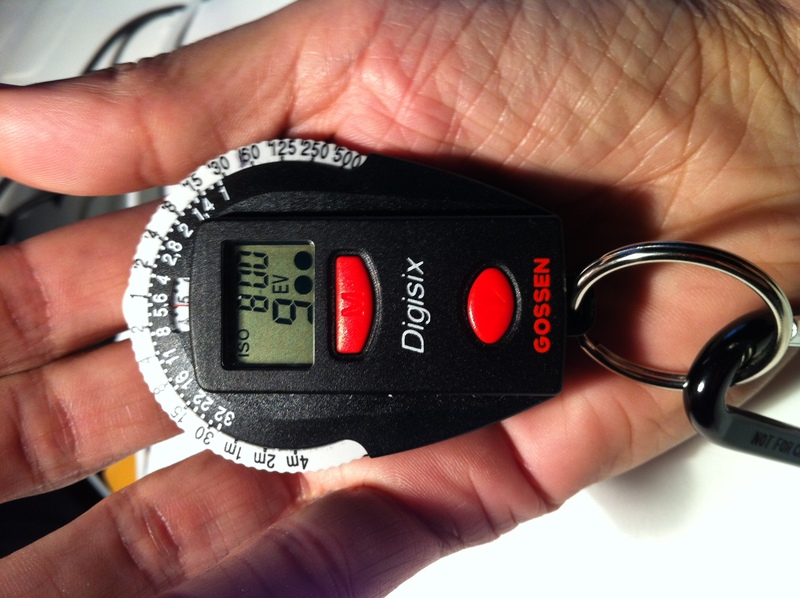 I'm used to how the digisix works because its a digital version of my my old GLP. It's quick, simple, and operates in a fashion that I'm used to, fits in my pocket, and weighs next to nothing. It also happens to be the cheapest one out there. So for anyone looking to get their first meter, without spending over $200, I highly recommend it. BTW not tailored for still photography. Skewed more towards film/video production. @Mark_the_Harp until I tested the dynamic range of the camera (I thought it had more latitude), I didn't see a need, but now I mainly use it to determine contrast in the scene, and to help me read exposure on faces where the in-cam meter might get polluted by surrounding light bleeding in. With a hadheld meter you are right there, you can get tight accurate readings, and in my experience better exposures than with the camera's meter alone. @shian: Of course, I understand. I just wanted to put in some good word for the L308DC. @shian Seems like a very good idea to prefer a dedicated light meter over the gh2 one.. I expose by histogram rather than the light meter which works ok; as a result I tend to forget which settings I use and it's not failsafe; particularly for skin-tones (faces) like you suggest. In dark situations I've found the gh2 meter particularly hopeless. One more item to the list! @Rambo now that I've done intensive testing, I've found that the GH2 actually underexposes everything. A meter reading of +/- 0 is not a true 50% even exposure but in fact a 40% exposure EXCEPT in Nostalgic mode. Nostalgic boosts the shadows and mids to the right levels, but does not handle the highlights very well. There's a very short IRE span between stops above 50%. Very easy to overexpose on Nostalgic if you are not careful. @shian Would you prefer a light meter to an external monitor with false colour? I will always use a hand held meter because I can light a scene without a camera being anywhere near the set, I can work things out on a scout, I can work without a monitor. So I'll never NOT need a meter, but I LOVE false color. The only problem is when you shoot RAW and you are applying a LUT for the monitor feed, the LUT affects the False Color, and will sometimes lie to you. So like for this recent television gig, where it was independently produced, and needed to be sent to the Network for final approval. They weren't sure they were going to be able to keep the "look" on final delivery because it was so dark and contrasty. They might be forced to go with a different grade, and that grade may not work for the lighting, and under those conditions, the balance of the picture might be way off. So I had to light for both, and the RED M-X has this weird bug where you have to toggle the raw, deselect the curves when you check the raw image, then reverse all that to get back to the LUT, and if you do that too many times (like more than 5), the camera will lock up, and/or start acting really weird. SO while I love FC, I know my meter won't lie to me. How do you calibrate the meter to the Gh2? thanks. Too complicated to go into here because every film mode profile has a different curve, but basically over expose by 1/3 to 2/3 of stop, except on Nostalgic. I'll go in depth in the ColorGHear Film School series, where I examine each camera profile, and show you how to get better exposures on the GH2. @shian .. Can you explain how to determine if a camera is underexposing or the meter is overexposing .. vizaviz I am asking not because I doubt you, but because I'd like to determine which of my tools .. need calibration. @kavdani Gray card and waveform monitor, there's one in almsot every NLE, just learn to read one. I go over all of this in my tutorials. @shian .. Cool .. that's the way I have been doing it. I think your use of 'extensive testing' and 'Too complicated to go into here' made me think there was more to it. @shian 'Too complicated to go into here because every film mode profile has a different curve, but basically over expose by 2/3 of a stop to a stop, except on Nostalgic. So ignoring what color profile you're using, does iso 320 on this meter match iso 320 on the GH2? No offset calibration required? @mrbill you r opening a huge can of worms with this. Every meter is off depending on manufacturer, so you'll have to calibrate it using a gray card, a waveform monitor, your cam's meter, and your meter. My Gossen is within a 1/4 stop of being dead on - minus the 2/3 stop the camera is underexposing, except on Nostalgic. I ask because the 308DC has an offset function that does just that - of course, it's trial and error before you get it right for your particular dslr. Wondering if the Gossen has a function like that. @mrbill no it doesn't, but I could take it into Samy's and have them adjust it, but then it would be off with every other camera I shoot with. I'd rather memorize the offset and compensate myself.